With the ever-changing nature of information technology, the Geographic Information System has been gradually transformed how it is displayed and used from 2D into 3D. 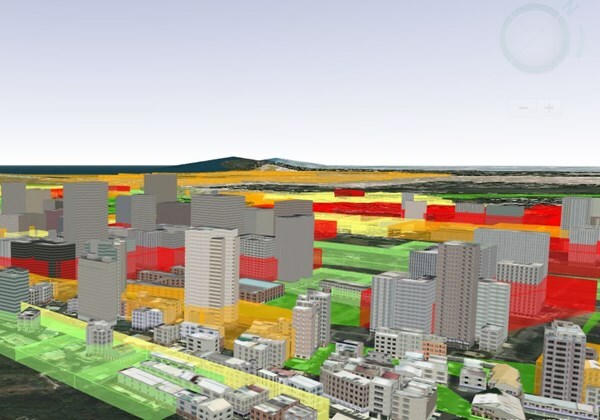 In many industries, such as land management, urban planning, environmental monitoring, disaster prevention and mitigation, users are keen to establish a suitable 3D GIS solution. The leaders in these industries are also looking forward to building a global service composed of 3D spatial data, including Digital Terrain Model (DTM), satellite images, 3D building models, road networks, addresses, administrative boundaries, underground utilities, and so on. SuperGIS 3D Earth Server can share most kinds of spatial data with front-end users through the internet or an intranet. There is no need for them to understand the complicated architecture or the design on the server-end because all they need to do is to access and use the services published by SuperGIS 3D Earth Server. For front-end users, they can directly see the spatial data displayed in 3D right in front of their eyes as well as using tools they are familiar with to explore it. What’s even better, these services can be accessed by multiple people online at the same time, making sharing the results of GIS projects among different users easier. Display your data in 3D environment, enhancing the visual effect and help you check the data in a more realistic scenario. By the centralized management of massive spatial data, the needed storage space will greatly be reduced. Different access levels can be set up for users respectively to secure you valuable data. Integrate data delivered from different GIS server and publish them as easy-to-use 3D web GIS applications. Different client-end apps are allowed to utilize the services, enlarging the possibility of making related applications. For example, field workers can receive the services on their mobile devices to increase the efficiency of field inspection. The deployment of GIS Server can be scaled up with distributed installation to provide greater flexibility. Support server operating system Window Server 2012 or above and web server IIS 7 or above. Data are managed centrally. The published data will be saved in the same database, which is more convenient for you to manage, to delete, or to edit, etc. Provide front-end users a smooth user experience of operating 3D GIS web applications, which is comparable to software like bird’s-eye view of Google Earth. Also, it allows you to examine the 3D models in detail. KML/KMZ data can be adjusted according to the area and LOD that you want so that you can decide the size and the fineness to display data with ease. You can choose globe-shaped surface or flat surface as the coordinate system of your 3D map. Support various geographic coordinate systems and projected coordinate systems, such as WGS84, TWD97, Web Mercator, etc. The built-in tool for coordinate conversion helps integrate data imported from different systems. Support 3D building models in KML/KMZ, and CityGML formats. You can penetrate the ground and check the distribution of underground utilities such as electrical wires gas pipelines, the water supply and drainage systems, and so on.